Kalamazoo, MI - April 20, 2017 The Kalamazoo Symphony Orchestra is pleased to announce a new education initiative serving children of refugee families recently resettled in Kalamazoo. Orchestra Rouh offers regular, ongoing music instruction to children of Syrian and other refugee families. Rouh means both “hope” and “spirit” in Arabic, and the program is designed to nurture the emotional wellbeing of children through music instruction, led by teachers who are bilingual in English and Arabic, and including music from Arabic traditions. Orchestra Rouh is offered under the umbrella of KSO Education Programs in partnership with the Suzuki Academy of Kalamazoo. The program was founded and is led by violinist Ahmed Tofiq, cellist Bashdar Sdiq, and Arabic instructor Hend Ezzat Hegab, who have been involved with refugee relief work in Kalamazoo for the past year and recognized the immediate need for positive social and learning activities to help reduce isolation for families and speed up children’s English language acquisition. Both music instructors, who are from Iraqi Kurdistan, recently completed master’s degrees in music at Western Michigan University, and have previously taught and toured with the Youth Orchestra of Iraq. Orchestra Rouh participants meet four afternoons per week for violin and cello lessons and group classes at the Suzuki Academy of Kalamazoo. 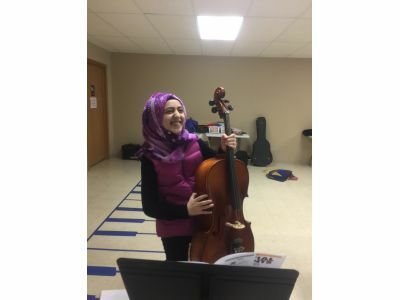 As they progress, they will be invited to take part in joint musical activities with the students of Suzuki Academy and KSO’s Kalamazoo Kids In Tune afterschool program to forge connections with other children. The program seeks to bring children together through music even in the absence of shared language. Traditional Arabic musical traditions and instruments will be incorporated into instruction alongside western traditions. String instruments for the program have been generously provided by Meyer Music of Kalamazoo, and Suzuki Academy of Kalamazoo is donating rehearsal space. The Irving S. Gilmore Foundation has provided start-up funding, and additional grant applications are pending. If you would like more information about this program or to learn about how you can help, please contact Liz Youker, Vice President of Education and Community Partnerships, at (269) 216-6778 or eyouker@kalamazoosymphony.com.